How Many Times Can I Not Learn The Same Lesson? Posted byphil	 January 15, 2016 January 15, 2016 Leave a comment on How Many Times Can I Not Learn The Same Lesson? I was a member of the Columbia Record Club. It was awesome. You could get a bunch of records every month – 13 for a $1 at the start of your subscription! In those days we didn’t have the internet to look up about artists so the only way to find out about new music was to ask your friends or read magazines – I particularly liked Creem and Circus magazines. 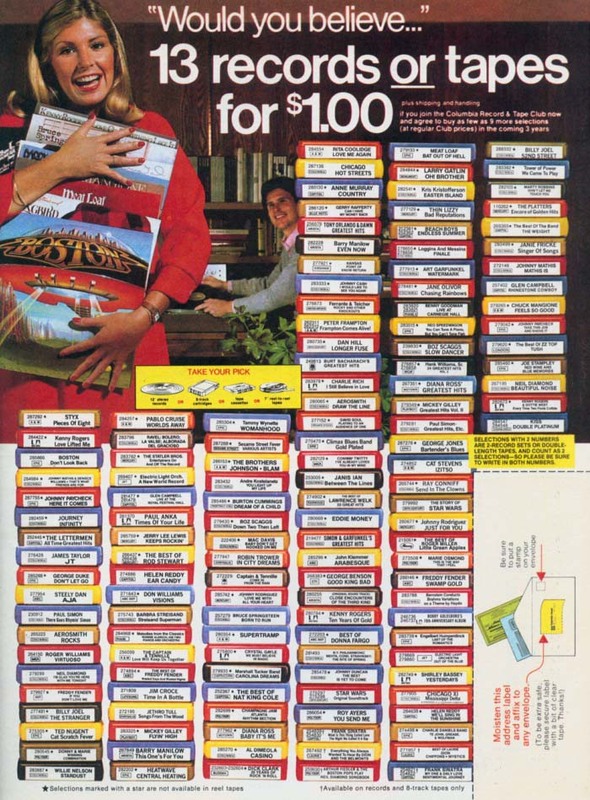 But the downside of the Columbia Record Club, also called ‘Columbia House’, was that you HAD to order. And cancelling was a pain. So you ended up getting the ‘record of the month’ a lot of times because you didn’t order something of your own choosing. In short, as cool as IT COULD have been, letting me listen to lots of different new things, I usually ended up with Pat Boone’s Greatest Hits or something like that. I never got anything cool. I should have learned a valuable lesson: people (i.e. me) are generally lazy. But I didn’t learn that. I didn’t learn a damned thing. I am still doing the same thing today! I am a subscriber to a few online services right now that I either don’t – or in some incredible cases CAN’T – take advantage of. Money flushed down the toilet. I think because, on paper as it were, these subscriptions seem like a good idea. If I paid attention I’m sure I would get a lot of added benefit in my life. Another factor is that these things are areas that I want to be interested in, and I was, for long enough to subscribe. But not long enough to keep using the subscription. I want to be a cinematographer, so I am subscribed to the (admittedly amazing) Shane Hurlbut cinematography website. I am not a cinematographer. 90% of my video shooting is me in my room in front of a blank wall – though I have a new green screen now. You don’t need to know how to simulate candle light in a multi-camera setup for that! Columbia House Cinematography Club! I want to immerse myself in a good audiobook every couple of weeks, but I don’t have the time (and there’s just not that many audio books I want to listen to, but then also maybe there is and I just don’t know about them), so my Audible subscription sits there unused. Columbia House Audiobook Club! I want to make lots of money running (or at least understanding) more about SEO optimization for websites. Columbia House SEO Club! I want to create videos that have all kinds of cool (remember I came of age in the 70s and 80s) video overlays and swipes and things like you see in wedding videos (or make wedding videos) so I am subscribed to an unlimited service that lets you download ‘cool’ backgrounds etc etc. Columbia House Video Creative Club! How much do I use all of the Adobe Suite (apart from Photoshop, Lightroom and Audition)? Columbia House Adobe Club! There’s probably more, but that’s all I can think of right now. If I try and take away a positive lesson (as I am obviously hopelessly addicted to this behaviour) from this it is that organizations depend on hobbyists and dabblers. I have a friend who runs a bunch of training courses for filmmakers. He knows that 90% of the people who come will never become filmmakers. He will pump them up with advice and inspiration and when they walk out the door they will never write a script or make a short film. Do you think that people are REALLY going to be cooking Moroccan food at home 3 months after they do their 1 day ‘Flavours of the Souk’ class? Are we enriching these peoples’ lives? Maybe, actually. Are we keeping these class and courses running for the 5-10% that will ACTUALLY benefit? Definitely. So, this is a business model. I guess the only thing is don’t think that you are changing the world by running a course like this. Most people will not use it later. But maybe you will change one person. And that should be enough. Or focus on changing yourself. As for me, I’m off to join the Columbia House Coffee of the Month Club.